Suddenly, Microsoft Edge may not work as expected. You may not browse any website using it. This article aims to give you solutions to fix we can’t reach this page error on MS Edge. Microsoft has postponed the Windows 10 October update. But, Who already have installed the update may encounter this edge browser error along with other issues. Fortunately, There is a solution to solve Edge not connecting to the internet issue. Before going through the troubleshooting steps, you should make sure you are only facing the problem with the edge. If other browsers are also experiencing this problem, it means something different. Then the problem is not an edge problem. It’s become of some internal issues with your internet connection or configuration. By the way, here are the methods to fix MS edge can’t reach this problem. Generally, Users don’t touch the DNS settings on their PC. As a result, They use the default ISP provided DNS. Maybe, That DNS server is unstable. So, User is encountering the problem with Microsoft edge. In this case, To fix we can’t reach this page, change the DNS. Here are the instructions. At first, Open the start menu, type ncpa.cpl and hit enter. It will open the Network Connections window. From there, double-click on the network connection you are using right now and click on properties. After that, Set the addresses as 8.8.8.8 and 8.8.4.4. From now, you should no longer encounter the internet connection problem with Microsoft edge. In case, the first method doesn’t help, this one can be helpful. For some users, it fixes edge internet connectivity issues like a charm. By the way, to make network profile public, follow these instructions. First of all, Press Win + I on the keyboard to open Windows 10 Settings. Now, Go to Network & Internet. At last, Tick on public and restart your computer. 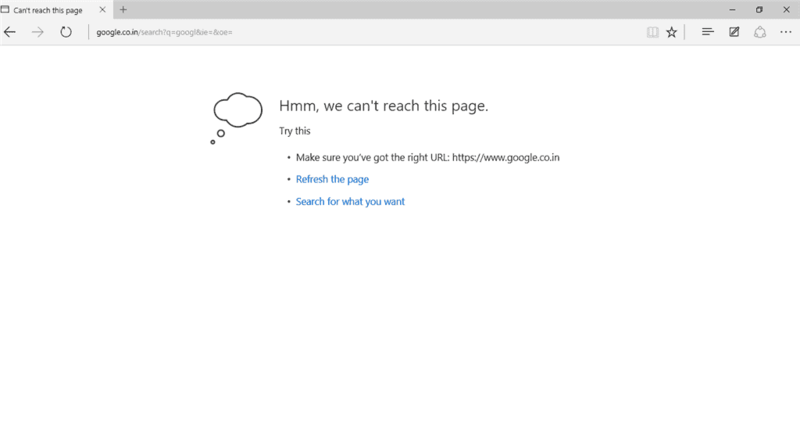 If you are lucky, it may fix “hmm, we can’t reach this page” error on Edge browser. After the October 2018 update, some people are encountering internet connection issues with MS Edge as well as some Windows store apps. For them, it is a life-saving solution. You should enable IPv6 to fix the problem. To do it, follow these things. At first, Open Network Connections window like method 1. After that, Go to your connection properties as shown in method 1. Then, Tick Internet Protocol Version 6 (TCP/IPv6). It should fix we can’t reach this page in Microsoft Edge. It is another great way to troubleshoot this Microsoft Edge problem. Resetting network settings will correct all configurations and help to get rid of common errors. To do it, follow these instructions. First of all, Settings > Network & Internet > Network Reset. Then, Click on Reset now. After that, It will reset all network settings and restart your computer. Now, You should no longer encounter we can’t reach this page error in Microsoft Edge. In some cases, The antivirus program or the firewall may cause issues with Edge. As a result, you experience connectivity problem. So, To fix we can’t reach this page error, try to disable your antivirus program temporarily. Then, See what happens. It should work if the first four methods fail. Sometimes, Corrupted cache and data may create this problem. In this case, Cleaning them can be an effective solution. But, Before that, i suggest you to do following things. At first, Press CTRL + SHIFT + P on the keyboard. It will open the InPrivate Window. Now, Try to browse websites. If you see there is no error in private mode, you should clean cache and data. To clear cache and data, press CTRL + H and click on clear history. Now, Check only Cache data and files and click on clear. Sometimes, Internal errors in system files can cause edge browser problems. In this case, you need to repair them. To do it, follow these instructions. Press Win + X on the keyboard and choose Windows Powershell (Admin). Type SFC / scannow and hit enter. It will repair and fix we can’t reach this page error on Edge. These are some best ways to get rid of the error that you are encountering in Microsoft Edge. I hope this article will help you.